Polonnaruwa - Polonnaruwa. - Locations in Sri Lanka. It's the main town of Polonnaruwa District in the North Central Province, Sri Lanka. 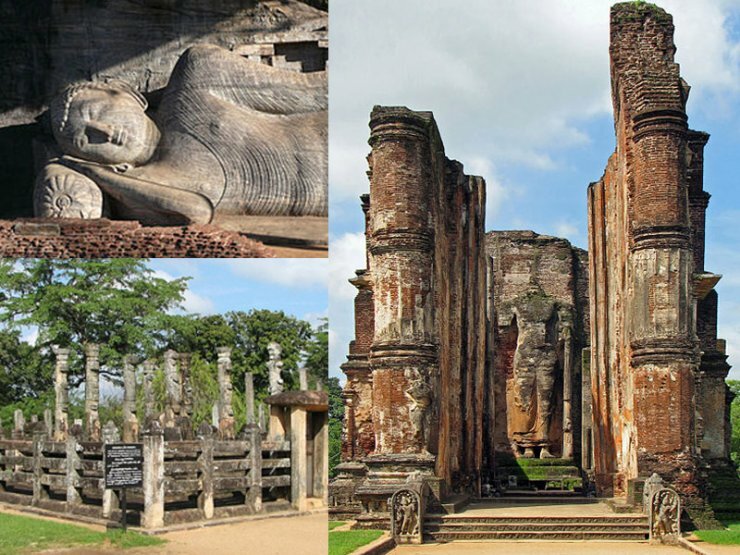 Kaduruwela area is the Polonnaruwa New Town and the other part of Polonnaruwa, remains as the royal ancient city of polonnaru kingdom. While Vijayabahu 's victory and shifting of kingdoms to the more strategic Polonnaruwa is considered significant, the real "Hero of Polonnaruwa" of the history books is actually Parakramabahu I. It was his reign that is considered the Golden Age of Polonnaruwa, when trade and agriculture flourished under the patronage of the king, who was so adamant that no drop of water falling from the heavens was to be wasted, and each was to be used toward the development of the land; hence, irrigation systems that are far superior to those of the Anuradhapura Age were constructed during Parakramabahu's reign, systems which to this day supply the water necessary for paddy cultivation during the scorching dry season in the east of the country. The greatest of these systems, is the Parakrama Samudraya or the Sea of Parakrama. It is of such a width that it is impossible to stand upon one shore and view the other side, and it encircles the main city like a ribbon, being both a moat against intruders and the lifeline of the people in times of peace. The Kingdom of Polonnaruwa was completely self-sufficient during King Parakramabahu's reign. With the exception of his immediate successor, Nissankamalla I, all other monarchs of Polonnaruwa were slightly weak-willed and rather prone to picking fights within their own court. They also went on to form more intimate matrimonial alliances with stronger South Indian kingdoms, until these matrimonial links superseded the local royal lineage and gave rise to the Kalinga invasion by King Kalinga Magha in 1214 and the eventual passing of power into the hands of a Pandyan King following the Arya Chakrawarthi invasion of Sri Lanka in 1284. The capital was then moved to Dambadeniya. The city of Polonnaruwa was also called Jananathamangalam during the short Chola reign.